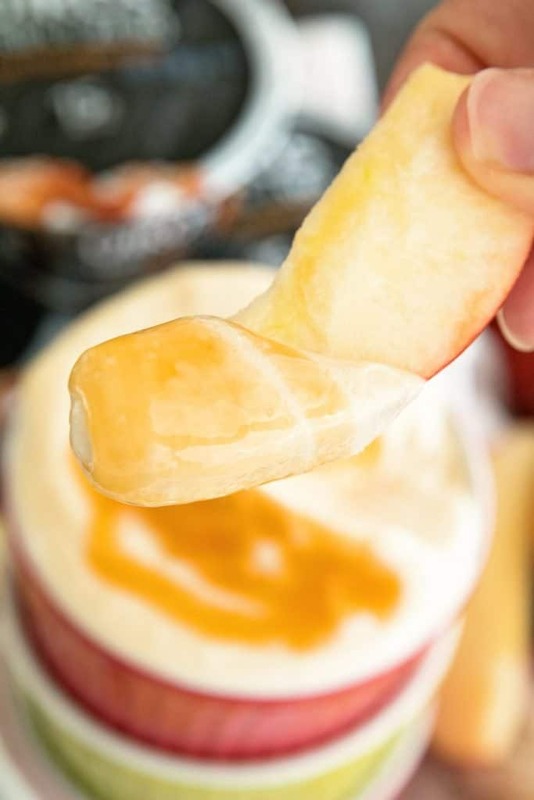 Salted Caramel Dip ~ Quick, Easy Dip Perfect for Apples, Pretzels and More! This Easy Fruit Dip is Easy Changed Up for Different Flavors! This post has been sponsored by Dannon. All thoughts and options are my own. I’m pretty sure I grew up a little bit sheltered in life. For example, I remember when my dear sister-in-law came into my life and introduced me to fruit dip. What?? You can make a dip, then proceed to dip fruit in this delectable treat? My world was shattered. This is amazing stuff! How did I eat fruit without it? One of my favorite is Healthier Chocolate Fruit Dip! Thank goodness my brother found her and married her so I could be introduced to this treat! After graduating high school I went off to college for hotel/restaurant management and included in the curriculum were several cooking classes. Let’s just say my eyes were once again opened up! I learned how to flambe, make homemade marshmallows, etc. I didn’t even know you could flambe before I arrived there. I surely didn’t know that you could actually make marshmallows! Please tell me I’m not the only one to grow up not knowing these things! After graduating and going out into the world on my own I learned about several different treats. One of them was yogurt, sure I knew it existed when I was growing up but never really ate it. It’s just not something my Mom stocked in the fridge. Funny thing is my Mom eats it all the time now! In fact it’s that one thing my kids go into her fridge looking for when it’s snack time! Then Greek yogurt became the rage and I was like, wellllll ya that’s a bit out of my bubble. I tried it once and it wasn’t my thing. Then a few years ago I tried it again. Either my taste buds changed or the yogurt changed because I live on it now! It’s one of my favorite snacks. Plus, I love that I don’t have to feel guilty about eating it. Unlike some other protein snacks, it has 0 fat, 0 added sugar*, and 0 artificial sweeteners – plus 15g of protein per 5.3 oz. High five there! Another thing I love? That I never get bored with it because there are so many different flavors. 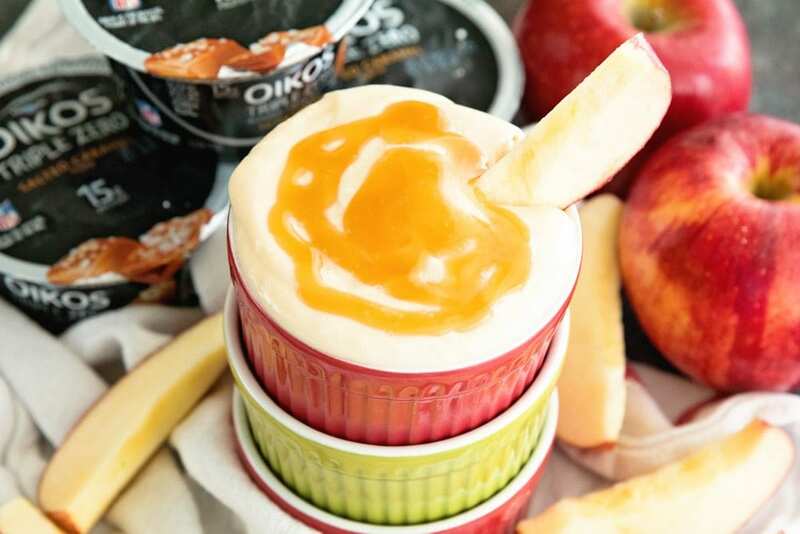 I grabbed a Salted Caramel Dannon ® Oikos ® Triple Zero Greek Yogurt for this recipe, but it would have been so easy to make this fruit dip recipe with the Strawberry, Mixed Berry, Peach, Banana Creme etc. Honestly, you could grab an apple, slice it up and dip it right in the yogurt and eat it that way, but I added a few more ingredients to really bring it over the top. See, it’s still super simple! Those apples are going to be calling your name after you see this! 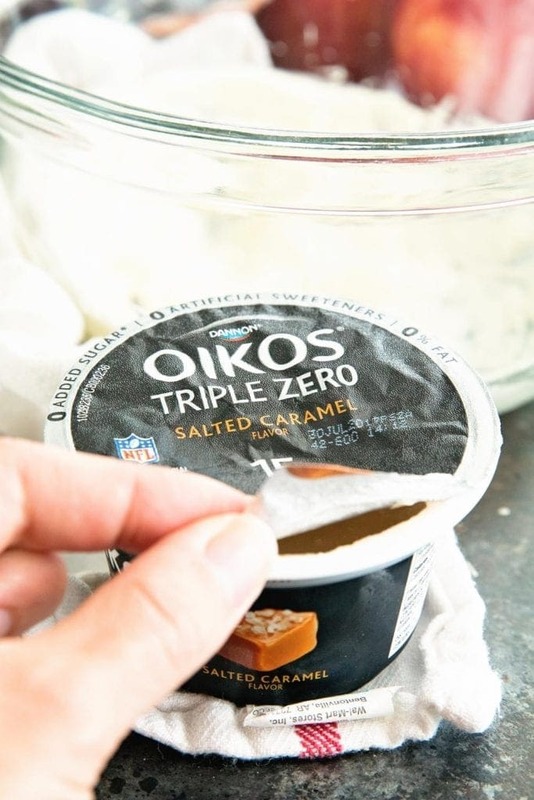 While you are at Walmart make sure you grab few extra containers of Salted Caramel Dannon Oikos Triple Zero Greek Yogurt to snack on when you are in a hurry! Also, grab a few different flavors and let me know what fruit dip you make with them. I want to try them with you! Ok, before you go I have a few more sweet recipes to check out! 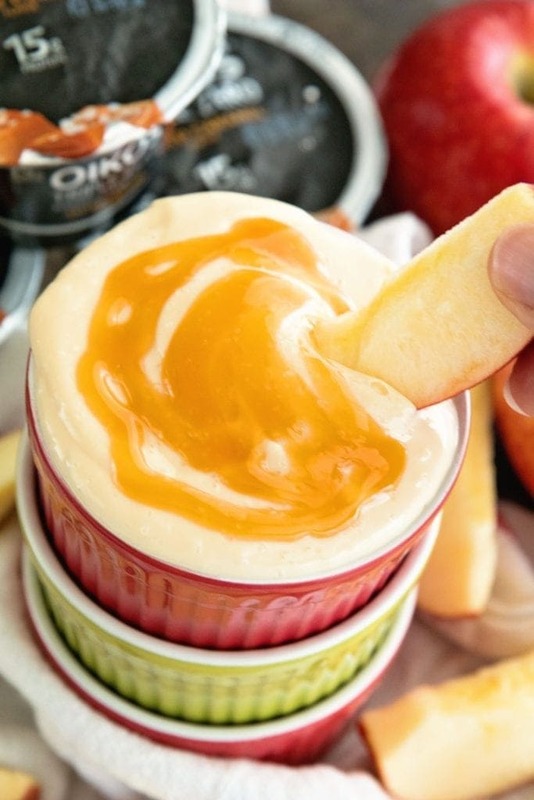 Quick, Easy Dip Perfect for Apples, Pretzels and More! This Easy Fruit Dip is Easy Changed Up for Different Flavors! 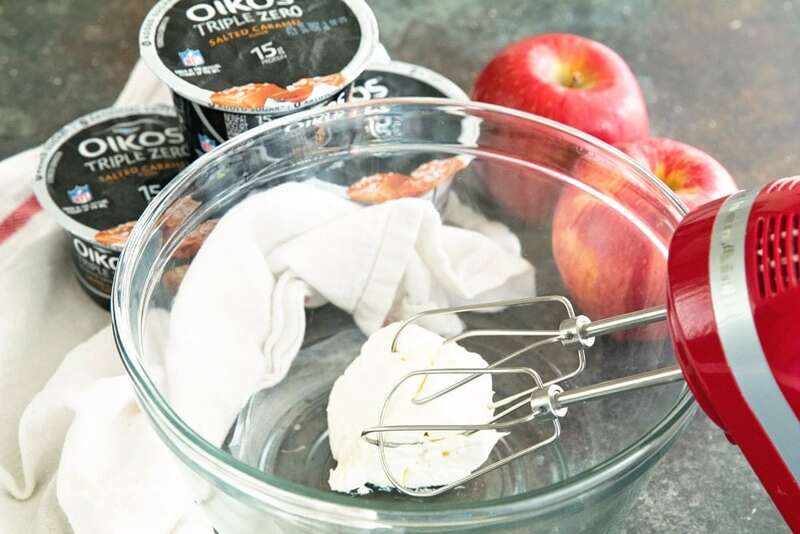 Using a hand mixer or stand mixer, beat cream cheese until smooth in medium sized mixing bowl. Add Salted Caramel Dannon Oikos Triple Zero Greek Yogurt and powdered sugar, and caramel sauce. Beat until combined. Garnish with additional caramel sauce and sea salt if desired.